Hopefully with rents kept at their present levels ( surely this is a very bad time to increase rents with commercial property values in freefall) and shoppers still willing to put on their clothes and leave home to walk down the streets into real shops, the remaining bookshops will be here well past the Boris Olympics, and into the roaring 2020s. Farewell Murder One ( finally booked) and the great Shipley Art book emporium soon to re-open in fancier premises, I am reliably informed. 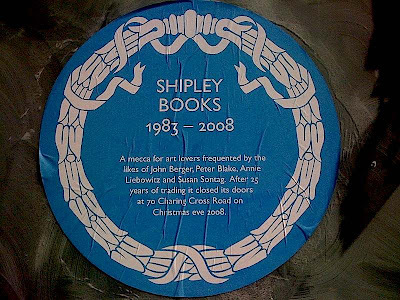 The Shipley plaque says - ' A mecca for art lovers frequented by the likes of John Berger, Peter Blake, Annie Leibovitz and Susan Sontag. 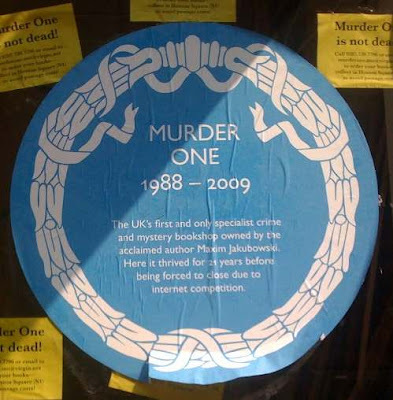 After 25 years of trading it closed its doors at 70 Charing Cross Road on Christmas Eve 2008' and the Murder One notice reads 'The UK's first and only specialist crime and mystery bookshop owned by the acclaimed author Maxim Jakubowski. Here it thrived for 21 years before being forced to close due to internet competition.' However as J W Dunne was fond of pointing out 'Nothing really dies' and Shipley will continue (see above) and as the little yellow notes around Murder One's plaque proclaim - 'Don't despair call Murder One ... for collecting books at our new premises located at Hoxton Square...' Their website proclaims that '...we are only an online bookshop and mail order, and get books in only for customer orders. So, if you stop by looking for books, the best we'll be able to offer you is a cup of tea!' From bricks to clicks. Sad, sad, sad. I used to buy good books at Shipley's and he kept the place warm with a real fire and we came in a long way and humped those catalogues home. Hope someone has still got decent art books--Wiener Werkstatte is my thing. And Bauhaus. Do the 'blue plaques' have any significance behind their shape color and style? Why are they the same in both shop windows? It's a shame they've closed, but it's Collets and its various branches, large and small, I miss the most. Was the smallest of the three in what was once called the Bomb Shop? Or was that an urban myth or lie? The Bomb Shop was no myth! It was going since after WW1 on onto the 1930s later. It was actually called Henderson's but became known as the Bomb Shop due to the incendiary views of Mr H. When I first came here in the 1980s I talked to customers who had known him (people were always breaking his windows). The shop was at 66 Charing Cross now the Everwell Chinese Clinic but formally part of the much missed feminist shop Silver Moon. I'd always thought it was the narrow shop that was even closer to Great Newport Street than 66. The shop was south of your shop too, so it must have been numbered in the low 50s. I'm glad to be corrected, though, and now I'll be able to point the correct shop the next time I'm on Charing Cross Road. Rage, rage against the dying light!!! A long way from Charing Cross Road, but with some interests in common with you, the Fantasy Centre in Holloway Road, Britain's- Europe's?- only second-hand SF and fantasy bookshop closes when its lease expires in june.